I took private violin lessons from age seven all the way up to age 18. Sadly, I only passed the Royal Conservatory Grade 9 Exam, and I attribute 99% of it to lack of practice. Not sure what to attribute that last percent to. I began enjoying the violin only after I started making friends in the orchestras, and I really started to appreciate and wish I played better once I stopped learning and started listening to how good everyone else was. My first string ensemble. I remember sitting in third violin, not knowing what the heck was going on, and pretending to play along. Ok fine, that still happened from time to time later on, but at least I made a choice then. I eventually made it to concert master and even had solo parts to play. I got to shake the conductor’s hand and have an asterisk beside my name in the programme. Awesome. After a couple years of violin, and seeing that I really wasn’t going to make it too far up the food chain, the conductor suggested (smartly) if I would consider switching to viola. I was tall by then, and could easily manage the slightly larger instrument, while the orchestra was desperately lacking violas (there was only one, and the rest were violins with transposed parts). I made the switch and loved the fact that I moved straight to the front row. I would later learn at Queen’s Commerce that this was called a “niche market”. I was important again, and I wasn’t even that good. I again got to shake the conductor’s hand during performances and had many more asterisks beside my name. I also made many good friends in SYO, and we even once travelled to Banff to practice and perform. We played in many festivals and competitions, as well as some charity concerts. I played in many quartets since violas were in so much demand. All in all, I truly enjoyed the experience. After going to university, I started missing music. 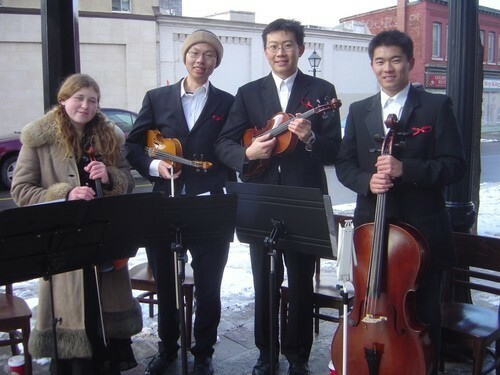 This string quartet was formed at Queen’s University when my friend Frank Wang and I decided we should stop letting our violins and violas collect dust. We found a cellist and another violinist and voila! The name derived from our first gig, which was outside of a local Starbucks, helping them with a campaign to raise money towards AIDS education. They gave us complimentary (you guessed it) Macchiato coffee. My latest aspiration - at the time of writing, it is still a trio and the name is still undecided. Actually, we haven’t even started practicing yet. But we will. We are all eager to get back into music after working for a few years, and now appreciate how lucky we were to be able to play before. In grade 7 when we started having band at school, I wanted to pick an instrument where it was easy to play the right notes in tune (ruling out the trombone). I thought about the sax and figured that was the quintessential jazz instrument, and picked it. I chose the alto sax because it was more convenient to carry around than a tenor or a baritone (and soprano was not a choice for our band). Starting out, it was easy to be one of the better players simply because most of the other students had no musical background or training. This afforded me many opportunities to play in extra-curricular jazz bands and jazz combos, with the ever-so-coveted solo sections that allowed one to completely improvise. Sometimes I would nail it and it would feel awesome. Sometimes I would blow it and it would be the worst feeling in the world. Band was one of the groups in school that frequently travelled, and I was able to go to Montreal, Quebec City, and Idaho through band. A jazz band that my friend Bryan started, we were a mis-matched collection of instruments that probably shouldn’t have played jazz together. In any case, we had fun plowing through pieces without really knowing what to correct and just having fun hanging out. We performed at a few Taiwanese Association events and I think that was it for us. My latest instrument. I figured guitar was too popular, and I’ve always wanted an instrument that I could take backpack traveling. It had a funny appeal too because it was so small and I am tall. I usually have it handy so that if I need a short break from work I’ll just pick it up and strum a few songs. I particularly enjoy Jake Shimabukuro and wish to be as good as him some day. I’ve taken all the rudiment courses, Harmony 3 and 4, and History 3 and 4. Harmony and History had some of the toughest exams I’ve ever taken, probably because I hardly studied for them. I remember in History, a question might be like, “Write about Symphonie Fantastique and its motifs” and I would just stare at it blankly (even though I actually played it in my orchestra). I had stacks upon stacks of flash cards just to memorize who wrote what piece - it was one of the first times I started employing the image memorizing technique, later popularized by the book “Moonwalking with Einstein”.